Thanks to CAPE (The Coalition of Asian Pacifics in Entertainment) and AMP (Asian American Media Professionals), I got to attend a small screening of Star Trek Beyond at Paramount studios. I won’t get into the story itself, but I must say to all my Trekkies: my solid ice cold anti-Trek reboot heart is starting to melt. I understand how this film had a 94% Rotten Tomatoes rating, making it a ripe tomato. I suppose one of the not great things was that my brain couldn’t keep up with the loopdy-loops and I got a little bit dizzy… I’m sure millennials, roller coaster fans, and fighter pilots will have no problem with this. On the whole, my actor/storyteller side was very satisfied with this film. It laid out everyone’s goals, hopes, and aspirations set out in the film with as little dialogue as possible and let the actors do their work. Yes, I saw elements of Ender’s Game alongside a nice nod to Picard, but I’m sure I missed a bunch of other ones that I’ll read in other blogs and reviews. What was especially satisfying with Pegg and Jung’s writing was the payoff of going along for the ride. The beginning and end were tied together into a satisfying bow, from the jokes to the life decisions to the renewed conviction. As far as the gay Sulu topic, as I predicted, it was a passing thought of sorts. It’s not like Sulu got married or was on a first date. It just ‘was’ which, I guess, is fine because we’re are now in an alternate universe that is apart from Gene (Roddenberry)’s universe. So finally, what melted my heart? When JJ Abrams rebooted the series by negating what had come before, it broke my heart. <i>Into Darkness</i> didn't have the same spirit that Gene had instilled in the series. JJ really wanted to make it 'his' and he did, but he lost Trekkies like me in the process. Justin Lin did a wonderful job doing right by Trekkies by recognizing what had come before through Spock. Lin recognized what had come before in the form of an alternate universe. There's a final scene in the film when Spock (Quinto) is silently looking at Ambassador Spock's (Nimoy) belongings that have been bestowed upon him. There's a photo of the Enterprise crew comprised of Leonard Nimoy, George Takei, Walter Koenig, William Shatner, DeForest Kelly, James Doohan, and Nichelle Nichols. It let me know that this crew existed in an alternate timeline and hopefully the soul of Gene Roddenberry's <i>Star Trek </i>will continue on in the next film. 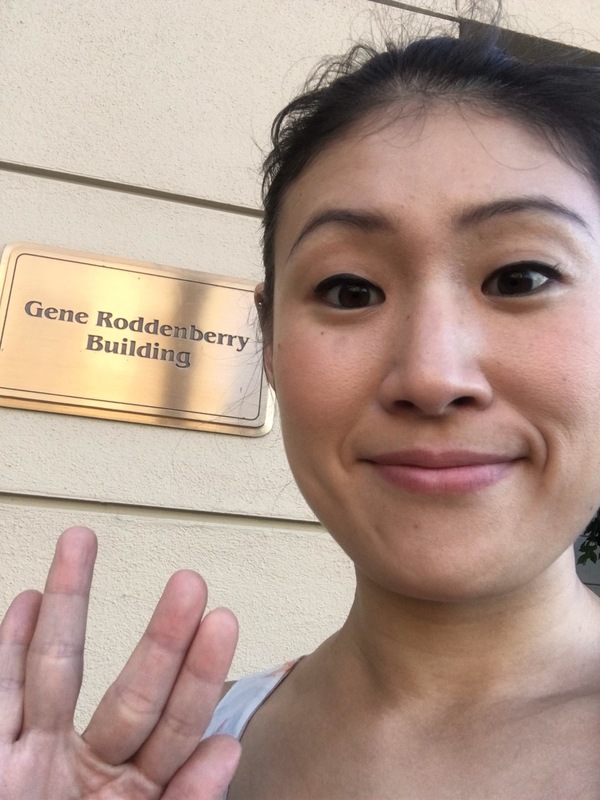 Before I walked over to the screening room, I went by the Roddenberry building and took a photo. Happy 50th Anniversary, Star Trek! I’m not a serious Trekkie by any means, but I saw the movie a couple days ago, and absolutely LOVED it. The Federation has nearly a trillion citizens within it yet we’re faced with mostly human crews. I want to see the diverse cultures within it. Very poignant indeed when Spock looks at Spock Prime’s belongings. I TOTALLY got dizzy with the loops…had to look away from the screen. But overall great movie. I thought the SFX was da bomb! Lin really added some originality to those SFX/VFX, which these days are becoming so trite and rehash. I saw Star Trek: Beyond, yesterday. It was a solid B. Simon Pegg said he co-wrote it. The special & visual effects were great. So, I think Justin Lin did a solid job and way better than JJ Abrams. I was a little irked by all the comical moments at first (Simon Pegg influence) but it got dark real quick! LOL I had to remind myself of the Tribbles episode. The draws for me were Karl Urban, Idris Elba and Sophia Boutella (who I really identify with). Chris Pine makes an adequate Kirk but lacks the swag that Shatner brought to the role. I don’t really care for Quinto as Spock, but whatever. Saldana is ok as Uhura. She doesn’t command the screen like Michelle Nichols did and she’s not as stacked. Sulu being Gay? So just because George Takei is Gay in real life, Sulu has to be Gay in the movie? I never picked up on that before, but whatever. Glad I checked it out for myself and I look forward to Sophia Boutella being in the next sequel. BTW, BONES was OFF THE HOOK! LOL Loved Karl Urban in the role. Glad they fleshed him out and he really made the movie! I want to see a real BADASS villain though and a real BADASS chick like Boutella really bring it next time, though. Federation bringing in these new worlds, exploring that would have been nice. My favorite series was Enterprise and DS9 the latter I felt explored more of the Federation it made people question the way of life and tense topics and aliens actually got a POV outside humans. I love Idris Elba and fortunately a semblance of his face was actually seen on that video and toward the end (No Andy Serkis moment for him!). Sadly, the same could not be said for the beautiful Sophia Boutella who got stuck in all that white makeup and black markings. As to diversity, I did notice that there were more humans at Kirk’s birthday party and the one that were there seemed to be red shirt type tokens and not full fledged “fleshed out” characters. Gone are the days of Data and Warf, etc! As to the TV shows, Enterprise was good, so was DS9 and Voyager. I also liked TNG when it aired. It still airs on TV but I’d like to see reruns of Enterprise and DS9 and Voyager. An ALL VULCAN spinoff would have been fantastic! I hope they bring an android on board in future. Makes it interesting. What is your favorite Star Trek race? I find myself liking the Klingons and Cardassians they have the best storytelling potential. Next Entry DC vs. Marvel: Which Movie Franchise Represents Its Audience More?